The luncheon will be held at 11:30 a.m. at the Langston University-Oklahoma City campus located at 6700 N. Martin Luther King Ave., Oklahoma City, Oklahoma. 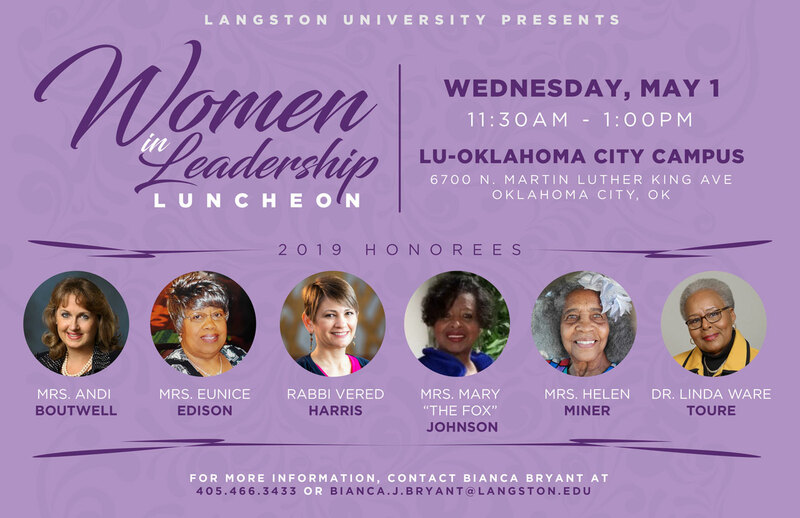 Six outstanding women leaders will be honored at Langston University’s annual Women in Leadership Luncheon on Wednesday, May 1, 2019. Leaders will be recognized for their remarkable achievements in their various professions. We will be honoring Mrs. Andi Boutwell, Mrs. Eunice Edison, Rabbi Vered Harris, Mrs. Mary "The Fox" Johnson, Mrs. Helen Miner, and Dr. Linda Ware Toure. These six remarkable women, who are role models for women, not only in Oklahoma but throughout the United States. In addition to recognizing outstanding women leaders, the event also serves to obtain financial resources and support for the University’s Young Women’s Empowerment Institute (YWEI). The luncheon will offer local leaders the opportunity to gain valuable insight into the YWEI mentoring program and a chance to hear how lives have been changed through participation. YWEI is a mentorship program for freshmen female students attending Langston University. It is designed to prepare them for the next stages of life and career through empowerment, support, and connections. YWEI is dedicated to the advancement of young women in the workplace and committed to leadership, communication and skill development. Initially derived from a partnership between Langston University and the Central Area of The Links, Incorporated, the program was an effort to create a mentoring program that addresses the need to empower young college women to successfully manage the collegiate landscape and graduate ready to engage the global community. It is a one-year program that provides transformative opportunities to young women between 17-21 years of age, who are first-time, full-time entering freshmen. The program helps improve their self-esteem and equip them with a life plan. The program is a series of seminars for the participants focused on professional development, social etiquette, health. and wellness. Additionally, mentors are brought in to educate and guide these young women. The follow-up and monitoring of progress of participant’s life plan continues through graduation and two years post-graduation. The program is a result of her efforts along with Alice Strong Simmons’, Central Area Director of the Links, Incorporated, vision partnering with Central Area Historically Black Colleges and Universities (HBCU’s) to work with young women attending these institutions, beginning with Langston University. If you would like to make a donation or for more information, please contact Bianca Bryant, at bianca.j.bryant@langston.edu or at (405) 466-3433.